Don't judge a book by its cover; it's a maxim many readers live by. And I don't, as a rule, buy books based on their covers. When I pull a book off the shelf in a bookshop I generally look at the back of a book first, to find out what it's about, and if that sound interesting I'll dip into the first chapter to sample the writing. When I buy a book online, meanwhile, it's because I've specifically searched for that book, or for books by that author, or for books in that academic series; the cover isn't a factor in my decision, because I was already planning to buy the book anyway. I do sometimes notice covers, but I'm much more likely to be put off by a bad (or unwelcoming) cover than attracted by a good one. I've been told by several people that Gaie Sebold's Babylon Steel is quite good, but I just can't get past its horrific cover. I've noted before that I probably never would have read Graceling unless it had been sent to me for review, because the cover (woman in impractical leather outfit in the snow) coded it as something (urban fantasy) that doesn't interest me. See also the plague of cosy-fic covers featuring out-of-focus ladies wearing pastels that adorn the three-for-two displays at Waterstones: those covers I notice, since they're face-upwards on a table, and those books I rarely turn over to read a synopsis. But occasionally I do buy a book because of its cover. I've been known to buy a replacement copy of a book I already own, and really like, because I prefer the new cover design. And sometimes a piece of cover art clicks with me, swaying me into looking twice at a book I might have passed over. 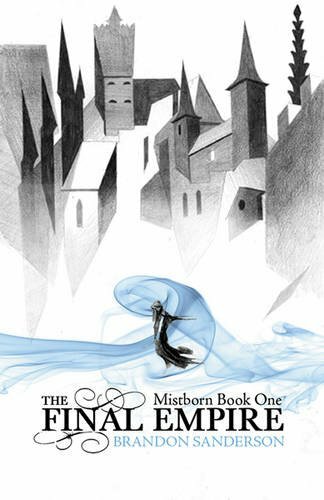 Elantris (2005), by Brandon Sanderson, was one such book. Unfortunately, I rather wish it hadn't been. Anyway. Because I can't bear to get rid of books I haven't read, and at least a tiny bit because I was hoping Elantris would turn out to be good enough that I'd have reason to buy the pretty, pretty UK edition, I ignored my previous experience of Sanderson's writing, and the warning of my fellow Alexandria Victoria about this very book, and decided to give it a go. No, it turns out Elantris has all the same strengths and weaknesses as Hero of Ages. There are some good world-building ideas: chiefly, the titular city of Elantris, once fabled for its magic and now fallen into ruin and taboo as the result of what many believe is a curse. One day ten years ago, the Elantrians found themselves waking with a strange affliction that resembles a cross between leprosy and radiation poisoning: their hair fell out, their skin became a black and grey patchwork, they lost all awareness of cold or heat, their hearts stopped beating, and their bodies could no longer heal even minor cuts and bruises. Revulsion and revolution saw the Elantrians locked up inside their rapidly decaying city by the neighbours who once looked up to them as gods, going slowly mad from gnawing hunger and the unrelieved pain of injuries they cannot heal; in the years since, any outsider who shows signs of developing the symptoms has been cast into the city, and ritually forgotten. "Our studies tell us slavery is illegal in Arelon, but those men keep referring to the peasant as their possession." Lukel frowned, turning eyes on the two contesting nobles. "Slavery is illegal, but it probably won't be for long. Ten years ago there weren't any nobles or peasants in Arelon - just Elantrians and everyone else. Over the past decade, commoners have changed from families that owned their own land, to peasants beneath feudal lords, to indentured servants, to something more resembling ancient Fjordell serfs. It won't be long before they're nothing more than property." None of this - or any of the other explanations we get, about trade networks, or how nobility is based on annual income, or the spread of a particular religious sect - is ever illustrated through episodes in the narrative or the actual experiences of named viewpoint characters. It's only ever summarised for us, little bite-size lectures on what we need to know to understand the mechanics of Sanderson's plot. It makes for tedious reading. "They say they give their women more freedom, but there's still the impression that the freedom was theirs to 'give' in the first place. "In Teod I am an unmarried daughter. Here in Arelon, I am a widowed wife. That is an enormous distinction. As much as I love Teod, I would have to live with the constant knowledge that no one wants me. Here, at least, I can try to convince myself that someone was willing to have me - even if it was for political reasons." This starts well, with the smart point about how her apparently more liberated homeland is still markedly paternalistic towards 'its' women. But then an examination about how women's status in societies like this is entirely reliant upon their marriage, and how widowhood often gives such women unprecedented freedom, gets buried under a bizarrely off-base whinge that doesn't even make sense (she'd still be a widow even if she went back home; the sea doesn't, so far as I'm aware, wash away marriage contracts). "Do you know what it is? The secret, I mean?" Kahar smiled. "I haven't been hungry in days, my lord. It is the most amazing feeling in the world - I don't even notice the pain anymore." See? If people living with poverty and disability only put their back into some good honest work, they'd find that their pain and hunger just sort of... evaporates. After all, it's not like disability is real or anything. Magic! I feel slightly ill. And I won't be reading any more Sanderson, however pretty the covers are.